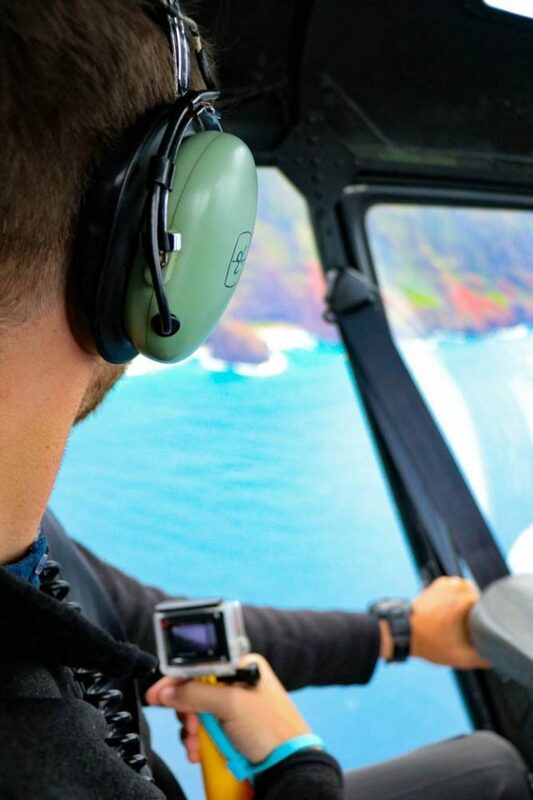 Taking Off On A Doors Off Helicopter Tour in Kauai » Lavi was here. 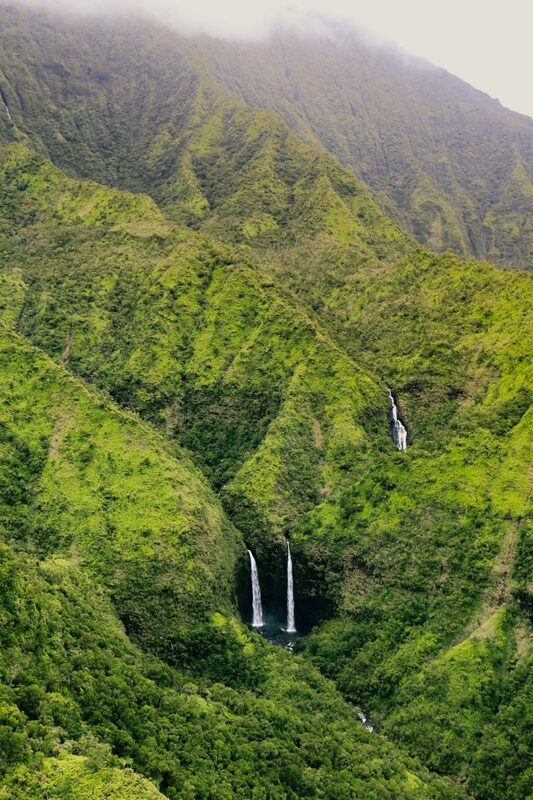 Kauai, the “Garden Island”, is known to be the wettest place on earth. 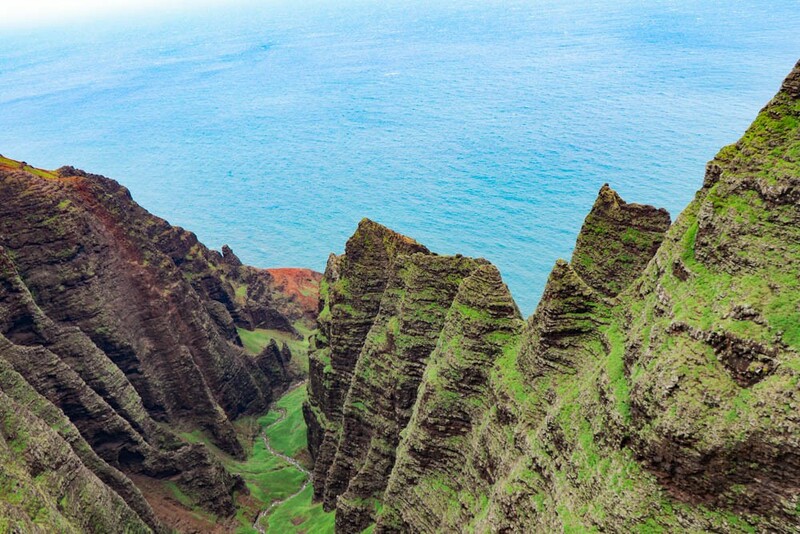 Naturally, the island’s lush coastal landscapes, waterfalls, and canyons are absolutely stunning. It’s a place you just have to see in real life. My one piece of advice about the island? 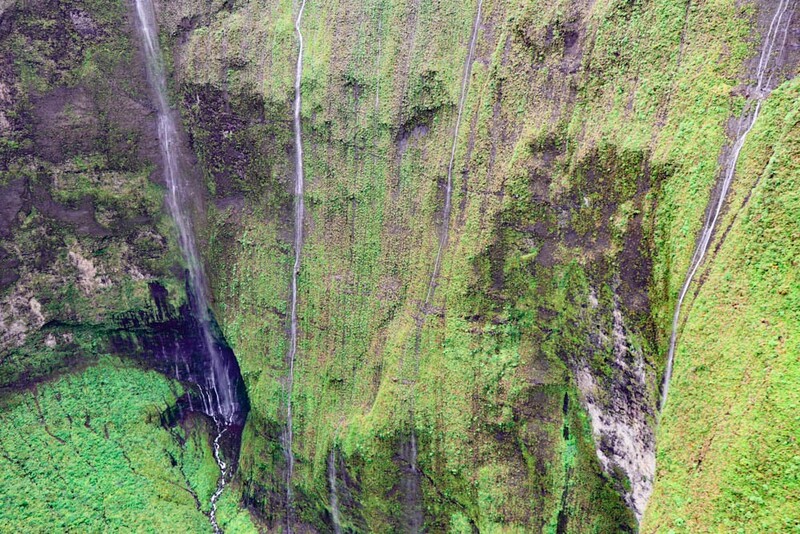 Go on a doors off helicopter tour in Kauai. Just trust me, you’ll thank me later. 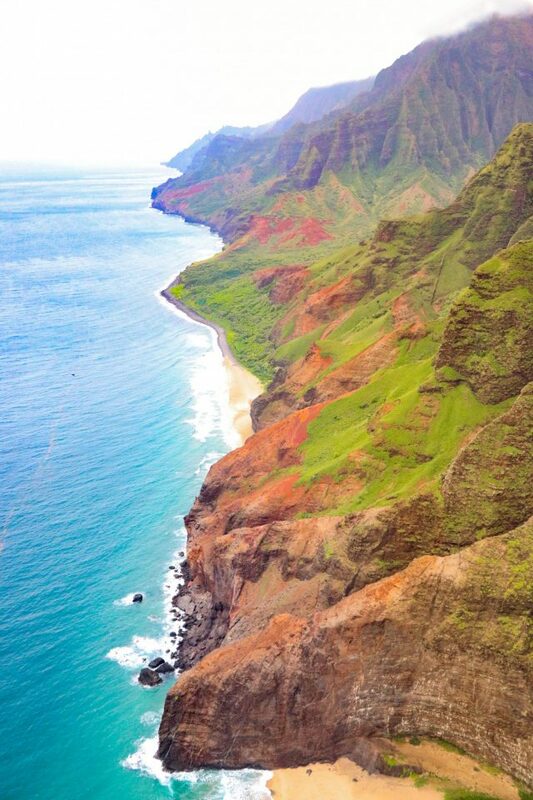 Visitors to Kauai can only see about 10% of the island by car, and it’s recommended to rent one for your trip. I still wanted to see more! Unfortunately, Hanalei Bay closed off due to the bad rainstorm during my stay. We had to see the island from above to get a comprehensive view. 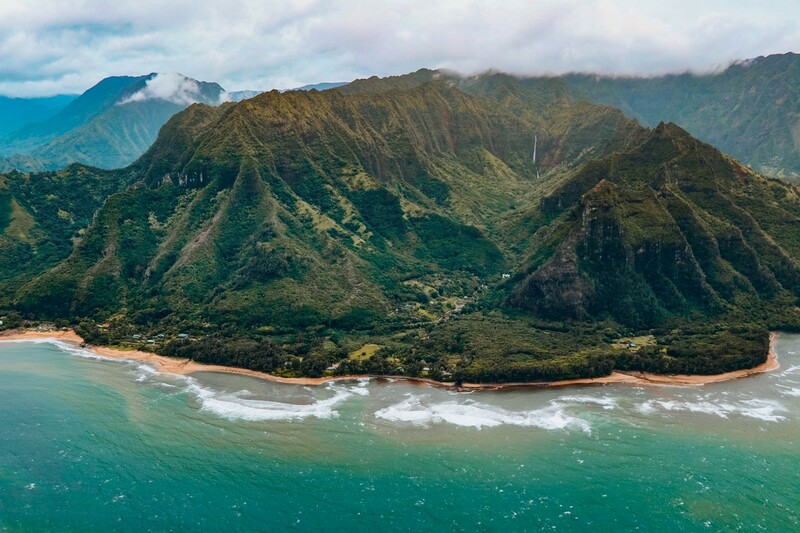 Road tripping around Kauai is fun, but seeing it from above is an unforgettable experience on its own. 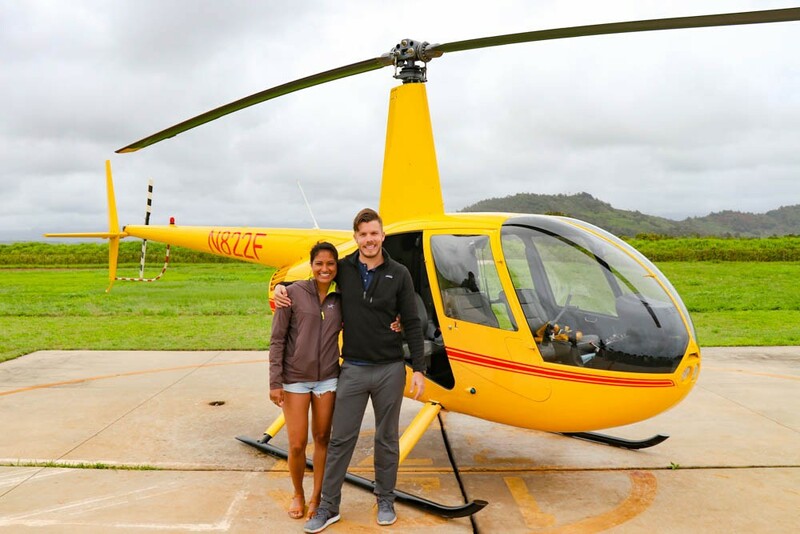 After doing some research and speaking to a few helicopter tour companies, I opted for the one-hour doors off helicopter tour in Kauai with Mauna Loa Helicopters. This wasn’t a sponsored tour; we happily paid full price and it was so worth it. 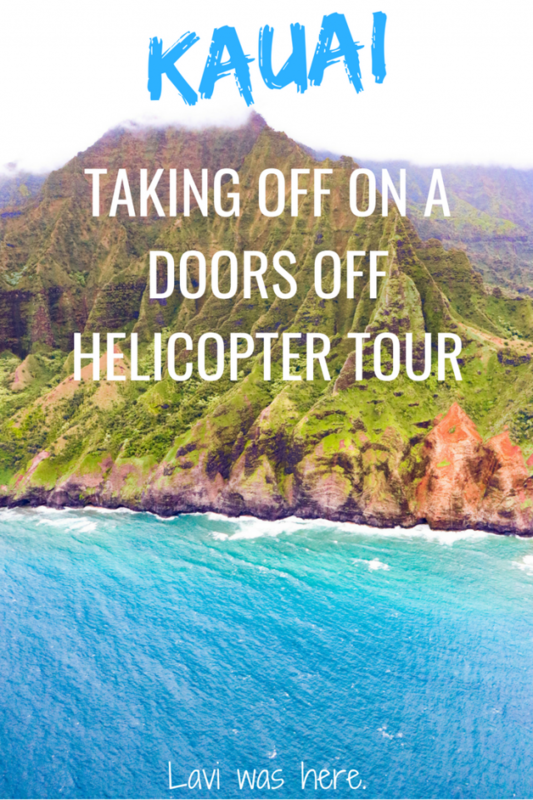 I chose this specific helicopter tour because I wanted to go on a doors off helicopter tour in Kauai and only a few tour operators offered it. I wanted unobstructed views of the island, especially without window glare affecting my photos. The tour was also special because the helicopter was large enough to fit only the pilot, Michael, and I.
I wouldn’t have to crane my neck around other tourists to take photos. In consulting with another company that had more seats on its helicopters, I learned that due to our combined weights being lower than the other tourists, we would have had to sit in the front of a larger helicopter with the pilot. We wouldn’t have had the doors-off views on this tour, which ultimately led me to choose Mauna Loa. I’d never been in a helicopter before, but I was too excited to be nervous. After I set myself up to do something scary, my mentality is usually to not overanalyze it. Similar to when I went hang gliding in Rio de Janeiro, I focused on floating above the scenery, not the distance between me and the ground. The weather changes so quickly in Kauai that many tours were canceled due to rain, fog, and wind. Actually, our first scheduled tour was canceled due to inclement weather. A few days later, we were lucky enough to take off on a semi-clear day. Our witty and experienced pilot relayed all the important safety information to us and was always quick to let us know ahead of time when we would be experiencing turbulence. The helicopter was essentially the size of a rickshaw or tuk-tuk, so it definitely swayed a bit as we flew over mountains and into light clouds. My heart jumped a few times when we hit turbulence, but I focused on taking photos to keep my nerves in check! Our pilot also served as an incredibly knowledgeable guide. He gave us a history of the island and knew all about the sights we flew over. We saw so many waterfalls and lush landscapes that I couldn’t keep track of the names of every natural beauty. I was blown away by it all and couldn’t believe how close we got to the jagged cliffs and waterfalls! 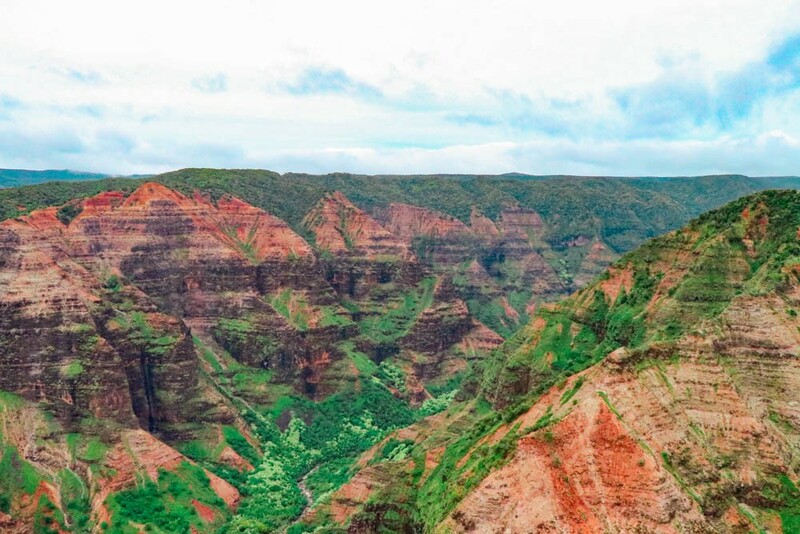 After glazing over the south shore and heading inland, we descended on Waimea Canyon. The green mountains slowly transformed into brown and red canyons with millions of years of earth layered together in colorful stripes. Rivers snaked through the deep gorges as white waterfalls speckled the landscape. I understood why Waimea Canyon is nicknamed the “Grand Canyon of the Pacific”; the scene looked very much like the portion of Arizona’s Grand Canyon that I walked through when hiking to Havasu Falls. Michael and I marveled at the close-up views from inside the canyon. 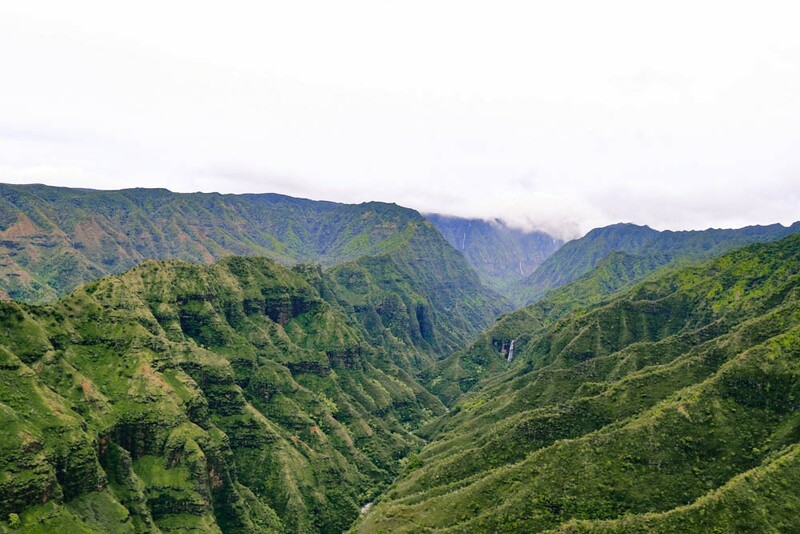 It felt surreal that we had hiked Waipoo Falls in Waimea Canyon just a few days earlier. 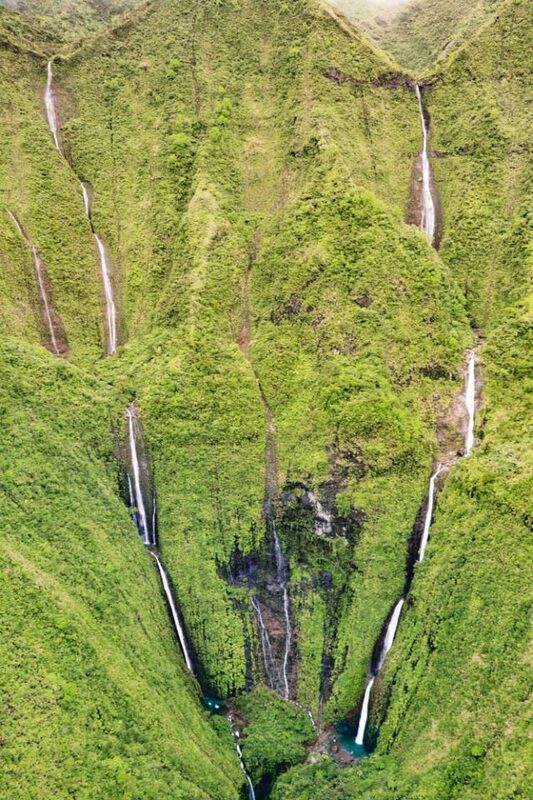 I imagined seeing us standing at the edge of the cliff by the waterfalls from above in the helicopter. Both views were worth it. 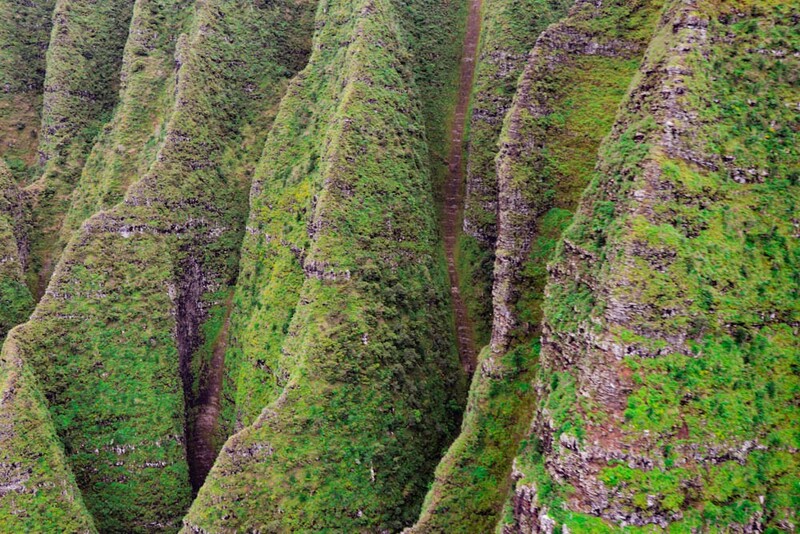 The main event of the doors off helicopter tour in Kauai was seeing the Napali Coast from above. 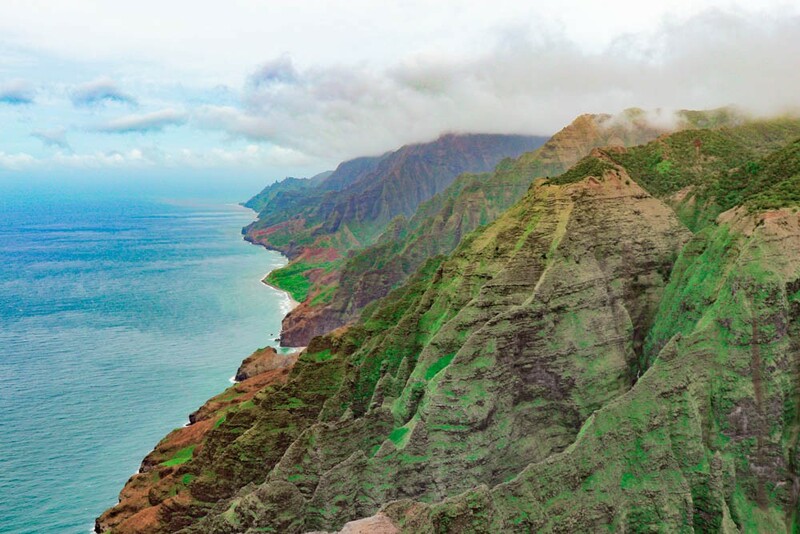 Like Waimea Canyon, we’d already experienced a taste of the Napali Coast when by hiking the Awa’awapuhi Trail, but we only saw a fraction of the coast from this viewpoint. 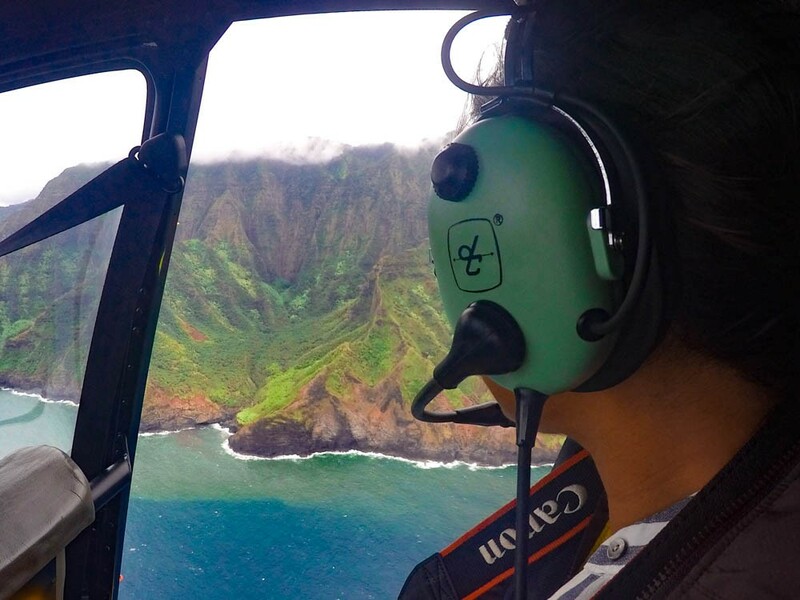 Our lighthearted pilot had the Jurassic Park theme song playing in our headsets as we soared over the Napali Coast. This was the culmination of the Kauai trip for me. 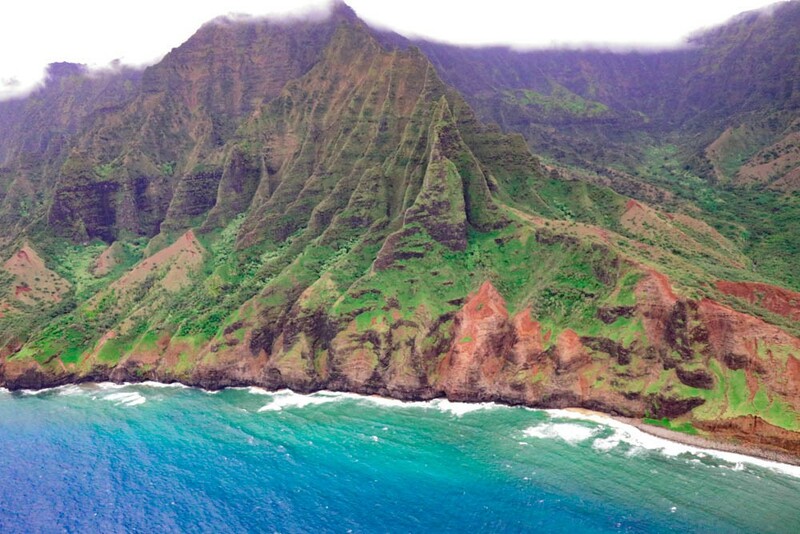 I had wanted to see the Napali Coast so badly and the threat of inclement made it so difficult to see it. To finally have an unobstructed view of the coastline was a dream come true. We flew into the jagged folds in the mountains, so close that I felt I could almost touch them. We watched birds flying from perch to perch and even caught a glimpse of a few goats teetering along the steep mountainside. 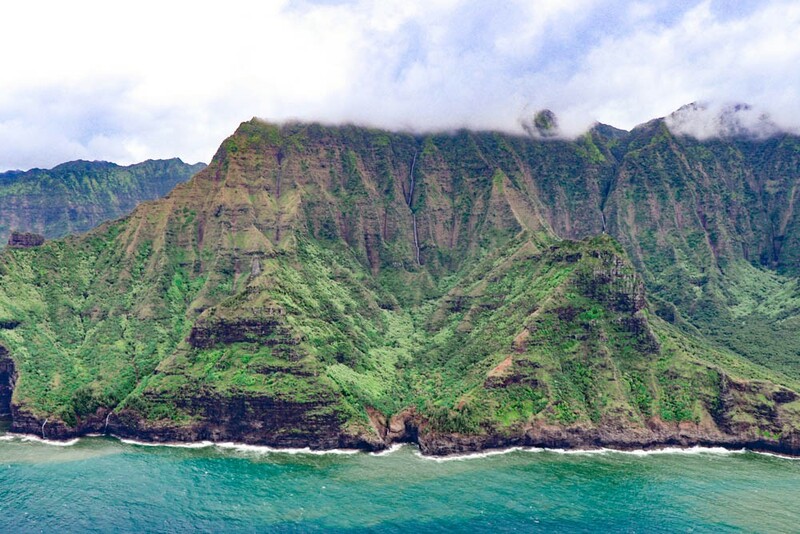 The Napali Coast has only limited access on land from the Kalalau Trail (now closed due to heavy flood damage) and otherwise can only be enjoyed by boat or helicopter tour. 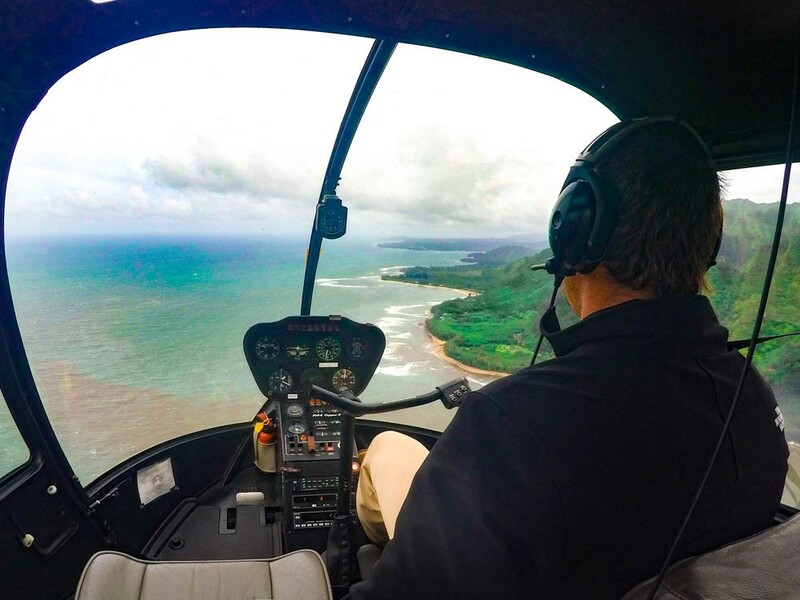 It was a privilege to experience its natural beauty on the doors off helicopter tour in Kauai. We couldn’t explore Hanalei Bay on the ground due to the heavy April rainstorm that devastated the area during our trip. Seeing the bay from above was sad, knowing that relief efforts were underway beneath us. Even in the destruction, I could tell that Hanalei Bay is a special and beautiful place. 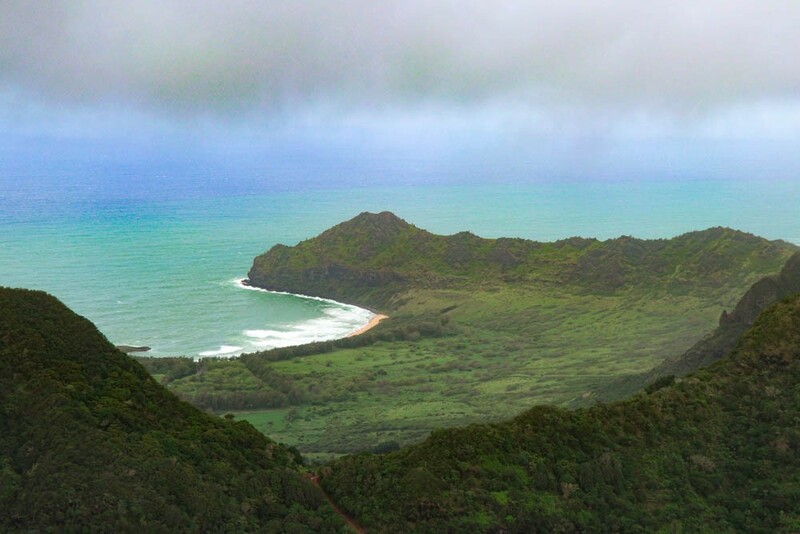 The last major sight we hovered near was Mount Waialeale, the second highest point in Kauai. Its summit is one of the rainiest places on earth, but our guide indicated that the recent storm created even more waterfalls down the “Wall of Tears” of the shield volcano. 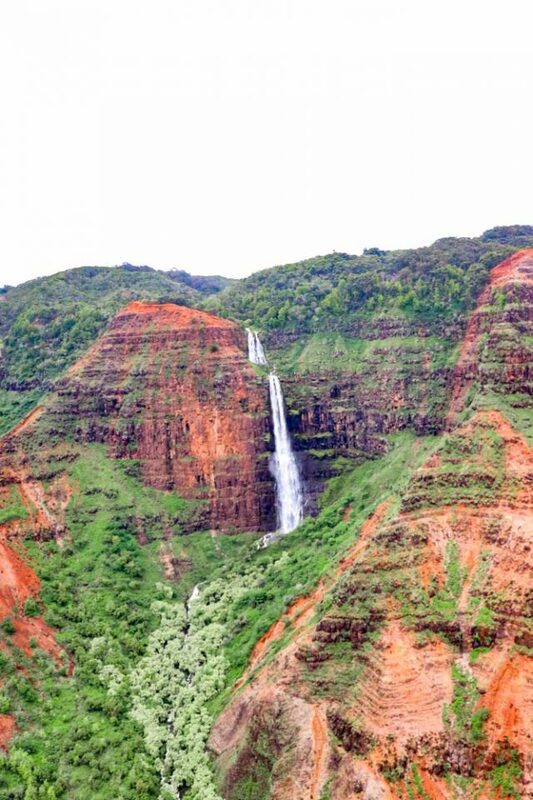 The sheer number of waterfalls in every curve, hill, and mountainside in Kauai truly surprised me. I’ve never seen so many waterfalls in one day! 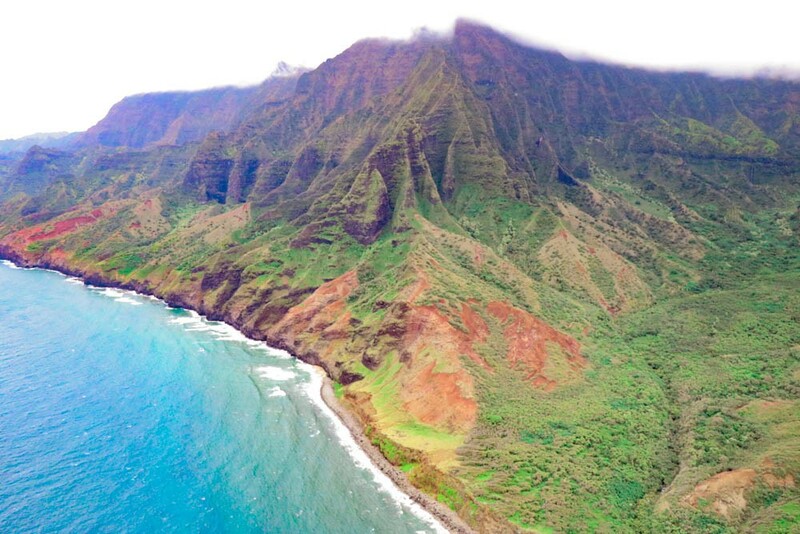 Who’s ready to jump on a doors off helicopter tour in Kauai now? Brilliant and breathtaking. I’ve never been through an experience of riding a helicopter while travelling, but your blog post has put things into perspective.